1 1/8" deep aggressive tread pattern that cleans out well in mud and offers great traction in all types of extreme terrain. 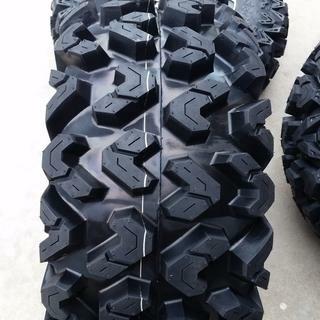 Tread pattern wraps onto the sidewall to increase traction in deep-rutted and muddy conditions. 6 ply radial construction offers stability, a smooth ride and absorbs the impact in extreme trail conditions. 28x10-14 and 30x10-14 tires are 8 ply rated. Ordered a set for my brother he really likes them. Good grip in most terrains we ride in the PNW. Just got my new tires and wheels. Stock ones were worn. Thought id' try the Rip Saws as I've heard positive reviews, sure they'll be way better than the stockers, quite a bit heavier and seems to affect the performance but not much and the traction will make up for that. Excellent in the snow, and on the trial! Highly recommended! Put these on a Grizzly 450 and they were WAY too aggressive there so I switched them to our Grizzly 660 and got some Kendas for the 450. HUGE knobs. I will definitely be buying another set when these need replaced!!!! Absolutely love these tires! I went 26x10x12 on all four tires! And am happy with that decision! First ride was in 1-2” of snow with snot logs and some mud! Tires preformed beyond my expectations! Phenomenal tire with ridiculous grip and gnarley look! I was able to try out the Sedona Rip-Saw R/T last Sunday. We received a soaking rain the day before and a lot of the trails were a mess. I had no problem traversing through the deep rutted trails or the mud holes. All my riding buddies were really impressed with the gnarley look too. Sedona Rip-Saw R/T-Phenomenal tires! Ridiculous grip! First off, I can't give these guys enough kudos for response time. I've ordered thousands of dollars worth of tires, wheels and other things. Every time, EVERY TIME, my toys show up within two days. 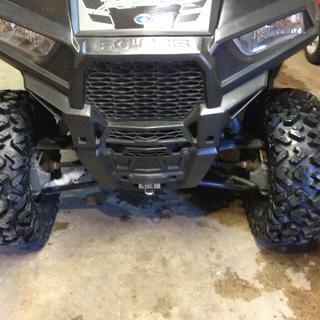 Now for the tires: I run these things on a Can Am 1000 and they are simply awesome! Yes, they are heavy but if your machine is punching out over 90 horses it is hardly noticeable. The new ones I just ordered were replacements for the two front tires. I managed to pop a hole in the side wall of one so I replaced them both as a set because they were showing some wear. I've had the set for about 4 years now and they hold up great. Many miles in Moab on these things and they are great for all terrain. I did, however, have them speed balanced so they are smooth all the way up to 80 MPH on hard packed stuff. Pictures just don't do them justice- they look ridiculous in person once mounted. Enjoy!!! Your tires are the best. 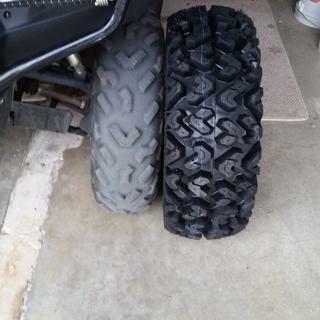 Just replaced old Sedona tires with new as the old excellent performers on my Polaris ranger and Polaris four wheeler. So far better than expected. They ride smooth and grab great on rocks / roots and normal NE trails. Though they do dig quite a bit in soft sand . They are perfect for my type of riding. This is my 2nd set of Rip Saws. I bought some 2 years ago for one of my 4 wheelers. Love them. 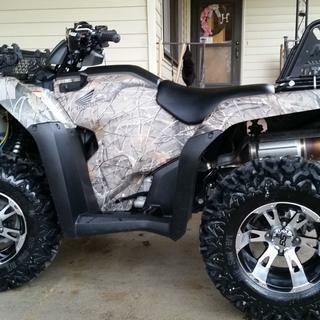 Just bought some for my other 4 wheeler. They are a beast. 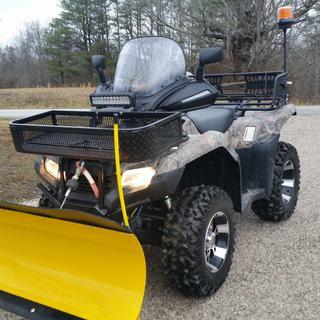 Used it in the snow pulling deer up a hill in very rough terrain. It was amazing . Very tough tire . Can't rate tread life, 1st set of Sedona tires. I put them on a 2016 Yamaha Wolverine R-Spec. Ran them on hard pack coal roads, dirt trails, & over rocks in the trail that you would have to use 4 wheel drive high gear. I was impressed that the tires did not slip or spin while driving up the mountain at a safe steady speed over some big rock. The tires are doing what I bought them for. They handle the trails I use & that makes me feel safer. 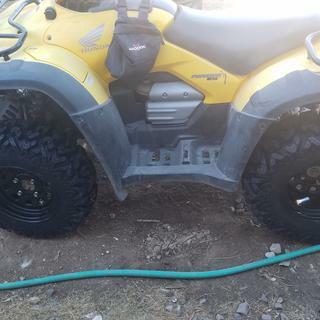 Mounted our Sedona Rip-Saw tires on our Wildcat 1000 and very happy with them so far. Did 300 miles this weekend and they were great. Wear seems good so far. Easy to install. Handled real well on roads, hardpack, rocks etc. A little loose on the sand and gravel but adds to the fun sliding in the turns (I guess I could have put it in 4 wheel drive...but why!). Will probably purchase another set if they wear well. Placed order and 25 hours later on my door step. 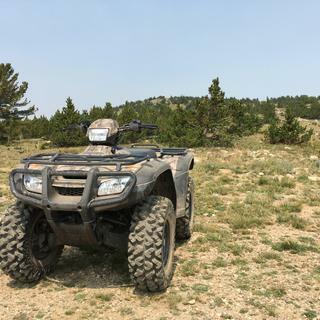 Only got about 100 miles on them, cant comment on tread life, haven't found any mud yet, so cant comment on that, Rocky trails with deep ruts, powdery dust large rocks nothing slows them down. They are on a Maverick trail. when we get some rain and muddy trails I can give update on traction in those conditions. When I saw the RIPSAW's on my porch, I could not wait to get them on my machine. We had them put on and went on an 80 mile ride in the mountains by our home. They performed amazing. Rocks, dirt, mud, water, hills, they took it all on with ease. Awesome, love the profile and handling ! So far they are great for the yard and for woods as well as the road We put them on our Yamaha Rhino. Cant wait to see how they do in the winter for plowing. Very happy that we also have a refund from Rocky M. because eafter we purchased them the tires went on sale and they gave us a credit to use in the future on their site. Very Nice customer service !! Brought these 2 yrs ago . I don't believe in doing a review right off till a full test . One I got the by far the best deal here. I got tires and rims delivered and mounted to me faster than any dealer could get for me. Plus I got rims and tires cheaper than I could get the tires alone plue I would of had to pay to have mounted. Now for the tire review . Then have one heck of a lug . I think I have the 8 ply not sure or maybe the 6 plugs and stock was only 4 ply but we ride alot from home in Vermont and travel to Pittsburg NH and sometimes Maine . On the logging road great control once u get used to them. More clearance . Climbing wet and steep hills w ease!!! Son loves to ride my things extra rough and thru the mud pits . So rather on the dirt road or climbing the wet hills or the mud pits ur safe w these tires and expect many many miles out of theses. I absolutely love these tires, a huge upgrade from stock. What a difference on the trails. They look awesome as well. Highly recommend. These tires have excellent traction and handle very well on and off road. I work on gas line right of ways where the terrain changes from mud to grass to blacktop constantly and I have no complaints at all. I would recommend these tire for any terrain and I would purchase these tires again. these tires are by far the best tires I have ever bought. I will every body I see the these are the tires you want to get for you machine. These tires are great! The sidewall tread works awesome in the deep mud! Bought a brand new quad and before leaving the showroom my buddy had me talked into buying these tires. I also purchased Sedona Rukus wheels (which I still like). I went up to 26" and since these tires are very heavy I also purchased a clutch kit which was recommended by the dealer as well. 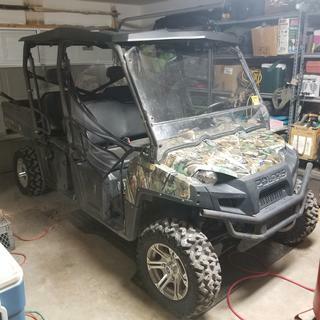 I took the atv straight to the farm and used it during our fall hunting season. 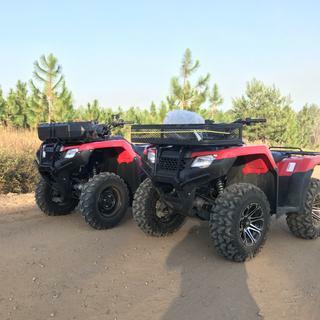 I only did low speed and all off road at the farm and they were ok, a little stiff and harder than I wanted and it will take while to get used to them. I brought it home from the farm a couple months ago and rode it on hardtop for the first time. I have just over 100miles on the tires and atv. The tires wobble pretty bad at 30-35mph and then it goes away and comes back so severe at 50mph that it shakes my MPH display so severe it looks blurry. I contacted Sedona and the rep for my area was initially very helpful. Come to find out there is a spot on each tire that is supposed to be 180 degrees opposite of the valve stem and my tires were mounted incorrectly. So I took it to my local dealer to get this resolved and that was bad experience but nonetheless they got remounted correctly. I then left them at 24psi (mounting pressure) just to make sure they seated right for several weeks. I finally aired down to 6psi and took it for a test ride. Nothing changed, if anything, it may be worse. I contacted the Sedona rep again but he has now gone MIA. Im sure these tires will last as they are very hard. They grip and do great in the mud and snow but overall they are not going to work on my machine. I realize that atv tires are not meant to drive on hardtop but everywhere we go we usually have to traverse some hardtop a bit. With a machine with top speed in the mid 60's, Ill never see that on my machine with these tires. Sedona has a warranty on these tires but my the area rep has fallen off the map and chose to not help or assist me anymore with this issue. I would not be so angry but its a brand new machine and I have almost $10K in machine that rides like garbage thanks to these tires. 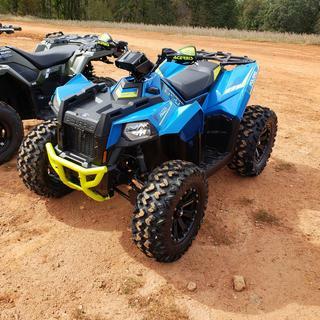 I will say that heavier SxS's probably do just fine with these but on my atv, its a horrible ride. 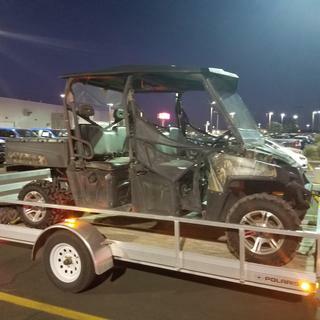 R/M ATV has a great 'price match' policy and fast delivery. 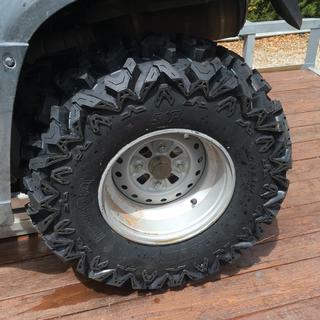 Tires were mounted on stock RZR wheels. Should be great tires if the snow would ever melt. A lot heavier than OEM tires. 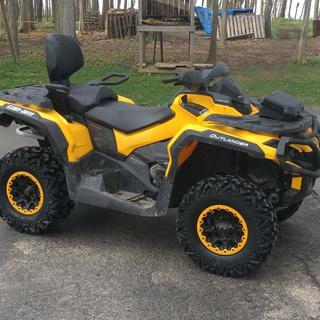 -m-2013 CAN-AM Maverick 1000R--the tires handle great, the tread design looks good for the riding I do. These tires grip like crazy. 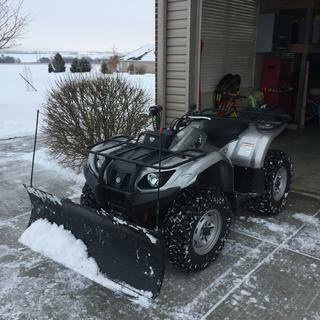 I mostly plow snow with this four wheeler but it gets some trail time too. Have put a lot of time on them and so far I cant see any wear whatsoever. But oh how they grip, these do better alone than my old tires with chains! Best upgrade I've made! 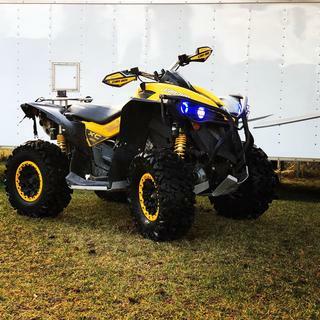 Put these on a king quad 750 and wow. I put 200 miles on them and have been impressed. they feel light like the stock tires ( I had a set of itp muds and hated the weight of them) in sand they feel great, rocks they grab and pull and on packed dirt they side hill like a snowmobile. Tread life may not be the best but I want performance. I have these on my Girl Friends KingQuad and was so impressed with them. I ordered some for my Polaris 850 Sportsman. 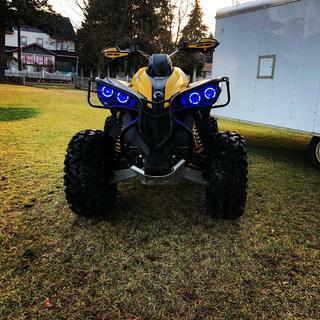 I put these on my can am 650 XT max. They fit wonderfully. They are a heavy tire at 40 pounds. I have only used them for icefishing in the deep snow. In snow they work really well and clear of themselves easy. These are replacing Carlisle ACT tires. There is a substantial difference between the construction of the two. These have a much firmer sidewall and a lot more tread. I would buy these again in a heartbeat. Awesome tires, awesome price and great people to work with. Delivery was fast and hassle free. Love my ripsaw’s on my ranger! Great for farm work and on trails! 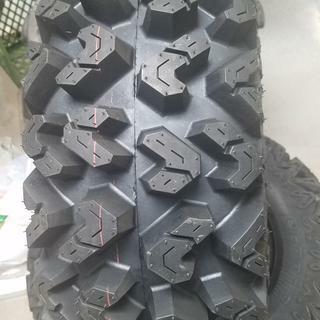 Can’t really give a review in tread life due to be new tires! 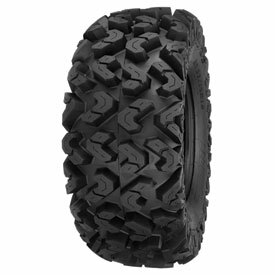 Awesome tires so far and quick shipping thanks Rocky Mountain atv! Put a set of 26x9-14 and 26x11-14 on a Polaris Ace. So far I have run these tires in 6-8 inches of snow/ice mix without any problem while breaking through a 1 inch sheet of ice. Also took them in the log woods where I ran them across flooded tractor ruts that were 18-20 inches deep without any trouble. Don't know about tread life yet as I only have 150 miles on tires. WILL BUY AGAIN !!! If you don’t own a rototiller that’s ok. These things are serious. SERIOUS TREAD! So let’s say you need to overturn your pasture but your rototiller is on the fritz. No problem just get on the ol ATV and take a ride around and watch the ground churn up. I have a graded and compacted base driveway on my property and I have to be careful when riding the atv around the property with these meats on or I’ll be re grading and getting the roller out! But out in the mountains and in the snow these dudes are the bomb! All traction and all beef. Rock crawl.... no problem. Snow.... they laugh at snow! Mud.... what mud! Oh yeah you mean the mud they throw! Yeah that mud. It throws serious mud. Do yourself a favor and buy that no stick mud spray the Highlifter has or you’ll be bring half the mountainside home with you. These are literally the best off road tire I’ve ever used. I wish they made these for my Landcruiser! Bought these for my Honda 420 4x4. I have yet to have any issues out of these. They have gone thru everything I've thrown at them, from deep mud to steep rocky terrain. I would recommend to anyone. I have yet to have them in snow but am looking forward to doing so. Great product! Plenty of traction on rocks and loose dirt. Highly recommend for the dry hard Arizona terrain. So far these tires have been great smooth road ride, didn’t tear up my yard when I used it for yard work, and good traction on the trail. Works great for paved road and all around. A lot better all around than stock and the 420 rancher has enough power and still be able to get to any speed. This is my second set for a 2008 Ranger. I ride really rough country in AZ and the fact I can pop a tire 20 miles from the truck and run with no air due to the stiff sidewall really gives me a piece of mind. They last me almost 10 years!! Awesome tire! Climbs up rocky hills like you wouldn't believe no signs of wear have put about 350 miles on them so far they handle great at high-speed's. No flats 6ply tire can't go wrong with these. Best off road, trail tire. This is my 2nd set of these Ripsaws. Fantastic tires for trail riding. I highly recommend them. Oh, btw, they look awesome on a RZR! These tires are round ! rubber ! black ! and they are knee deep in tread . will 26x9x12 fr 26x11x12 rear fir my stock 2014 ranger on stock rims? BEST ANSWER: I would be happy to check. Which Ranger do you have? BEST ANSWER: No they're not directional. These tires are on my side by side and they are the best tires ever they grip in mud dirt and water . We love these tires. On scale 1- 100 I would give them a 99. Great investment. There is no indication anywhere in any description or on the tire that they are directional. I believe I can say that they are not directional, with a high level of confidence. No tires are not directional so they are as good at getting you out of trouble as they are at getting you into it. They are not a directional tire. I really like these tires, they have great traction in all conditions. 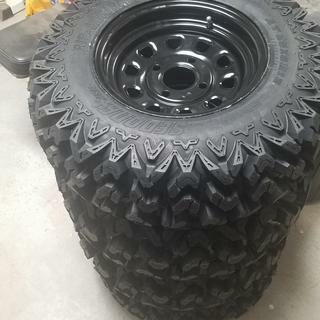 Hey guys..my stock front tires are 26x8x12 and they are 26" tall..since they dont make a tire this size and I dont have room for a 9" wide tire how tall are the 25x8x12 rip saws? BEST ANSWER: I think the tires are a touch taller than 25". They are probably the best tire we have ever used. No punctures on the face or sidewalls and very good tread life. 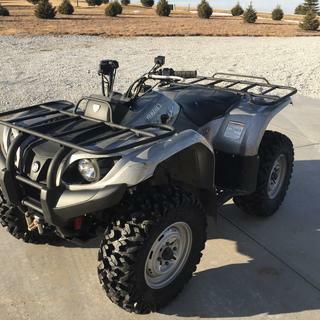 i have a 2010 polaris ranger 800 crew the specs for the tires are 25x 11-12 for rear tires, i am finding hard to find tires with these specs. what number do i have to be concerned with the 11? or the 25x? BEST ANSWER: With tire sizes the 25 is the height of the tire, 11 is the width and 12 is the wheel size. If you are planning on keep the same wheel size you will need make sure the last number stays at 12 or else you will need to buy a new wheel. The other two numbers (25x11) comes down to personal preference and how much clearance your machine has. If you are wanting to stay as close to stock as possible I would suggest going with a 25x10-12 tire. You would only be losing one inch on the width this way. We currently only have one tire in the 25x11-12 the link to it is below. I also included a link to all the tires we carry in the 25x10-12. does anyone know the weight of these tires? BEST ANSWER: Depending on size the weight can very between 26-37lbs. This info was found on Sedonas website on their tire dimension break down sheet. What ply do they come in? BEST ANSWER: These are a 6 ply tire. 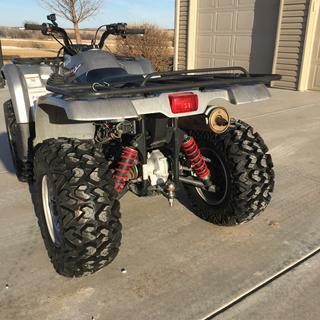 Can I get the the rip-saw r/t for my 1998 Polaris scrambbler 400 4×4 ? Are these tires very heavy? How much do they affect performance - both low and top end? These tires are definitely beefier than the stock tires that came on my Grizzly 660. However, I have not noticed any negative impact on performance but I admit I don't run WOT very much. I have noticed a lot of positive impact on performance. They really bite in both mud and snow. I have driven in snow when the belly pan was dragging and without chains I could cruise along. They are holding up well on rocky trails as well with no issues. I really like these tires and will buy them again. 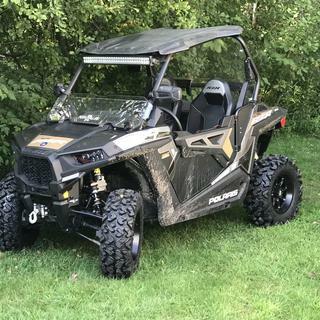 I have a 2013 Polaris Sportsman 550 Touring EPS. I went with the 26x10x14 in the back and 26x9x14 in the front (inch wider than stock). They are definitely a heavier tire, but I didn’t really notice any loss of performance. I have no other upgrades. With that being said, I plan on updating my belt and clutch kit to compensate for the increased stress the tires will put on my machine. But they are totally worth it! They have ridiculous grip and they look awesome! originalThey are average weight for a 6 ply radial tire. As far as performance I didn't notice much difference at all. However on another point they are the best by far traction tire that I have ever purchased and I never buy anything other than these in the future. 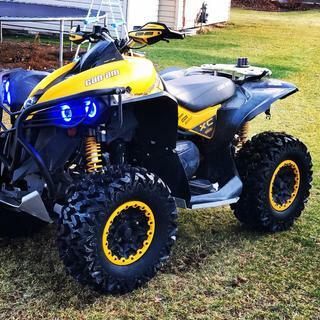 Mine are on a Yamaha Grizzly 700 without power steering and it handles much better that with the original stock tires that it came with. Hope this helps you with your decision making. The tire is heavier than stock tires, but I think it is a good thing being a 6 ply tire. I haven't noticed any difference in speed performance except the traction is great in different terrains. ( mud, snow, gravel, rocks) My machine handles and rides very well with these tires. All I can say about them is they are a well built tire that I have been very happy with so far. About your affecting performance depends on what you are trying to compare it to. They have a good ride and handling at all speeds and also a smooth one with no vibrations. You need to remember that they are 6ply and have aggressive tread, the reason for running them is for puncture resistance, cut resistance. I truly haven't noticed in my use any lag, but I don't use my machine on the sand or trying to just go fast. Running Rip Saws at 50 mph they handle pretty well, actually much better and smoother than the original knobby tires that came on my Yamaha Rhino and much smoother at a slow roll plowing snow up and down the driveway great traction. I have them on my 900 rzr and i didn't feel they affected the performance at all. They are awesome. I run them on sand most days. Semi rocky some, and have sone som heavy tock crawling and they did great. Yes, they are heavy, built like a tank, very deep tread.. i wasn't concerned about the top end, they are on a 550 Grizzly . I wanted something bullet proof to handle the sharp rocks in northern Arizona. I would recommend. These tires are awesome! They are heavier than the OE's I took off. The sidewall is a lot stiffer, giving one better protection in rough terrain. No affected performance noticed at high or slow speeds. Adam, I don't think they are that heavy. The tires provide great traction. I have them on a Honda rincon. I didn't feel anytype of performance issues. The tire are little heavier than most. They are Radial and have very deep lugs so snow and mud are not a problem. If you get the factory size ,they're a little heavy but they last a long time! Are these tires good in snow? I believe these are the best tires for anything. 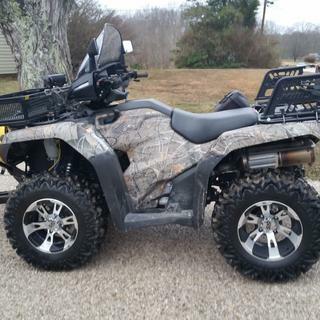 I got mine May 2015 and I put alot of miles on my ATV since I live next to Royal blue and windrock in TN. I ride alot and today they still look almost new cause of the very deep tread and the lugs being close together it will last and it will grab the mud and snow really good. i live in sisters. oregon. we have had snow on the ground going on four weeks. it is snowing now. these tires work very well. i would not use any other tire. i am going on my third set. I run these here in Northern Nevada on my Ranger and plow all winter long as well as calling coyotes. They are and have been great for me. Not very good sadly, I put these on my commander that I plow with. They don't hold a candle to the big horns I had on. Yes. I have had great luck with my tires in all conditions. They handle and grip very well. Yes, I live in Colorado and they will go until you get high centered in the deep stuff. yes they are good in snow. Yes they are good in snow & plowing snow. no I use them on my Commander for plowing and have not been impressed. Great in snow and mud due to the way they self clean so well. The Sedona Rip-Saw 27 X 11 - 14 and 27 X 9 1 14 size tires I purchased call for 7 lb PSI air pressure. What do you recommend for the air pressure? 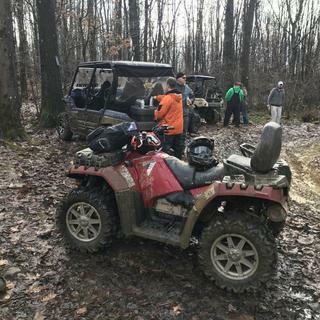 I run them on a 2015 Polaris Ranger 900 XP Crew. 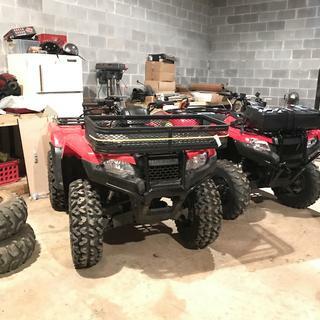 I have them on 2 machines: 2011 RZR 800 and 2014 Ace 325. I run them at 8 on the Ace and 10 on the RZR. When I have a passenger and a lot of gear I'll raise that to 11 on the RZR. Tires are wearing really well; I'm estimating at least 3500 to 4000 miles of use on them. I know the Crew is several hundred pounds heavier, so you may want to bump that pressure up a pound or 2. 7 to 10 lbs is good. But it depends on the ground you ride on. Softer for sand and if you are caring alot of weight a little bit more air 10 lbs. .I hope this helps. I ran 7 pounds in mine. How does these work in river sand? miles they hardly showed any wear and are as tuff as nails. Works great on wet firm sand and on dry sand you need to air down and don't hammer it. Worked great at Glamis! Great in wet river sand not my first recommendation for the dunes by cleaning really well they dig down fast. They will work well, they do like to eat sand a bit but not heavy digging. How deep is the tread on the 25x10x12? BEST ANSWER: Not sure on the 25/12 but after 2000 miles on my 26x11x14 they have almost an inch of tread. 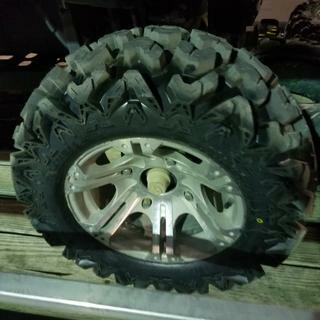 I am a member of the County Search and Rescue ATV team and this is the only tire we will put on the SAR machines, I do not think it can be beaten. I will only buy these for my own machines from now on. Tire specs indicate tread depth is 1 1/8". The tread is 1 1/4 in deep, incredible traction in snow or mud. I'm in the mountains here just amazing traction, beats all tires for the trail for any season. I have a snow plow on my ATV, no comparison with stock tires. great quality tire. Highly recommended. They are 1 1/4 inch deep lugs, best tire you can buy for hard pack, crawling, dirt and mud OK for snow to. These are made from off road truck tire rubber which is better then ATV grade rubber. Perfect tire! This tire not dot approved would they be alright to run on black top roads at 35 to 40 mi. per hr. about 500 mi. a month? BEST ANSWER: I have run then quite a bit on asphalt and they get very hot and don't hold up well. If you are looking for a better road tire I would go with the Moto Hammers, which I also have and use a tone when I ride in AZ and Utah. My machine is street legal and ride quite a bit on roads. I switch my wheel package out from the Rips to Moto's when riding out there. Hope that helps!!! I don’t think they would be a good tire for the road. They have a very deep tread ..Great for the off-road. Not for the road for the amount of miles you want to put on them ..
it should be alright. the tire is a very hard compound and should wear well. I run a lot on gravel as well as blacktop roads. Kevin, the Buzz Saw XC's are stamped, "Not for Highway Service" so I would say probably not. These are really, rough terrain, rock tires. I would assume the STI Black Diamond XTR's are the same. how much air pressure should i put in rear tires on a 2000 honda ex400,.? BEST ANSWER: I ran 8lbs, they worked great on all surfaces. Remember that these tires are SOFT rubber and have high rate of wear on any hard surface. We spent 5 months last summer in mountains ( all rock) wore the tires out in 900 miles. Great traction but no life on hard surface. PS NO flats. What is the actual diameter of the 28×10×14 ? BEST ANSWER: I am running two different sizes of Rip-Saws. The diameter of the 25x10R12's is 24", and the diameter of the 26x10R12's is 25". Hope this helps. 28" is the OD. 10" is the width and the 14" is rim size. These are great tires. They have handled flawlessly on all terrains I have ridden on. 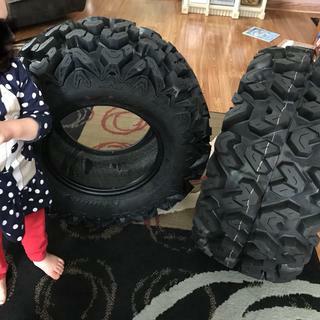 I have a front wheel that is a 12x6.0 and a wheel that is 12x7.5 will these tires fit? BEST ANSWER: As long as you order a tire with a 12 inch rim size it will fit. The last number of the tire size will tell you what size rim it will fit. What is the maximum air pressure for these tires? BEST ANSWER: These tires have a 36PSI max. BEST ANSWER: Unfortunately, this tire is not D.O.T. approved. 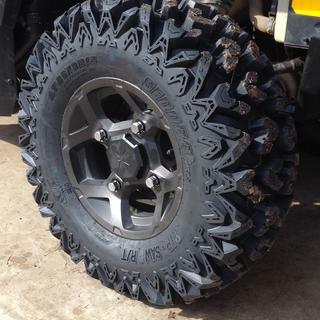 However, below is a link to the UTV tires we do carry that are D.O.T. approved. 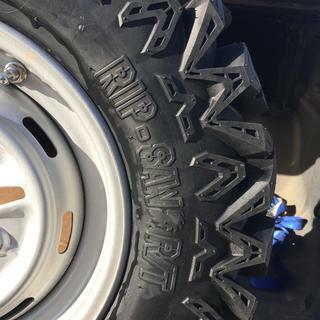 Does Sedona Rip Saw make a 26 x 8 x12 tire? BEST ANSWER: They do not. However, they do have this in the 26x9-12 which would only be an inch wider. 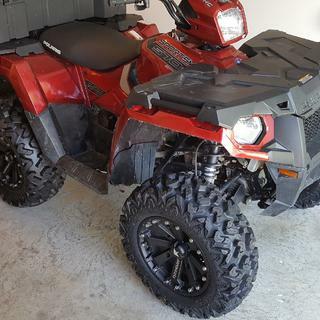 I HAVE A 2013 POLARIS SPORTSMAN 850 TOURING HO, WILL THESE TIRES FIT? THE STOCK SIZE IS 26X8X14 FRONT AND THE TIRE SOLD IS 26X9X14 DOES THAT MAKE A DIFFERENCE? SAME WITH THE REAR, 26X10X14 STOCK AND TIRE SOLD IS 26X11X14. BEST ANSWER: The only difference is that you will have a little more surface area on the ground because the tires will be about an inch wider than your stock sizing. BEST ANSWER: OEM stands for Original Equpment Manufacturer. OEM parts are all of your stock parts that came on the machine.